Can you put all the pieces back together? Can you make up your own pattern? Pattern Play is essentially a set of colorful trapezoidal blocks that fit on a square tray. The toy comes with dozens of cards, each of which has a different pattern that your child can construct. That's ... pretty much it! You can point out the cards, or you can just let your kids play around with the blocks. One thing I learned from Christopher Danielson (whose website Talking Math With Your Kids inspired a lot of my work) is that kids who play with mathematically rich objects will develop more sophisticated ideas over time. At first, maybe they just fit the blocks together however they want. The colors are bright, the wood is sturdy, and they do fit together to make pleasing shapes. But after a while, perhaps they'll drift over to the cards and start working on a pattern. Then they might even make their own! There's not really a wrong way to play with the Pattern Play blocks. They're one of the most versatile toys I've recommended. 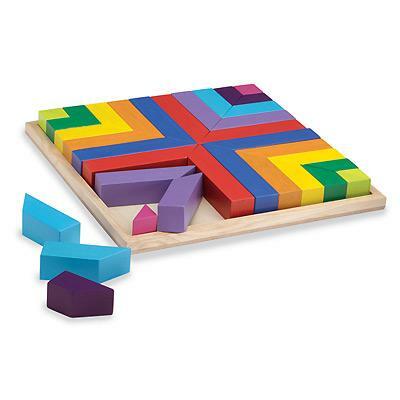 Pattern Play blocks are full of mathematical avenues your child can explore. Perhaps they'll start putting the pieces together to make larger triangles or squares. This will help them consider the way that shapes can be composed of smaller shapes, and how they can be decomposed into their constitutive parts. If they start copying a pattern from one of the cards, they'll be working on their spatial reasoning. As they tilt, twist, and otherwise change the orientation of the blocks, they'll start to develop a keener sense for how the blocks fit together to make the overall pattern. They might even get a first, informal introduction to the idea of angles. The blocks each have two 90 degree angles, as well as a 45 degree and a 135 degree angle. I wouldn't expect your child to be able to verbalize the idea of an angle, but they might notice that two of the small angles combine to fit into one corner of the square tray. Or they might notice that they can fit four corners of the blocks together perfectly, but if they use the smaller corners, they can fit eight blocks together. The idea here is not that Pattern Play is teaching your child any formal mathematical ideas. The idea is that your child is developing informal experience and intuition about shapes that she can then lean on in the future when her teacher starts talking about things like "angles" and "quadrilaterals" and "rotations"
Pattern Play is one of those math toys where the best place for a parent is in the next room. Lots of kids love games with structure and rules, but kids also need a chance to play on their own, without any outside limitations or expectations. With that said, your child might ask for help or to show you her newest design. In that case, jump in! For younger kids, a great question to ask is "Can you put all the pieces back in the tray?" This task seems straightforward, but it's quite a challenge, especially for little hands. Just like in the cooperative variation of Blokus, your child will be visualizing a place for a piece, then flipping and rotating it until she can find a way to fit it in with the others. As a bonus, at the end of the game there's nothing left to clean up! If your child wants to work on a pattern from one of the cards, you can ask "Which section of the pattern do you want to work on first?" It's possible that your child is a bit intimidated, and all she needs is a bit of structure to help her get started. If your child hasn't yet tried to make their own pattern, you should ask them to! Treat it like any other art project: "Can I see a pattern that you've designed?" Your child might use this moment as a chance to combine and refine some of the spatial ideas they've encountered since they began playing with the toy. Pattern Play is a great toy because it's accessible to toddlers, yet fun for kids who are otherwise too old to play with blocks. Enjoy!